CHICAGO – It is “Taiwan Cinema Days” for the next couple of weeks at Chicago’s Asian Pop-Up Cinema (APUC) series, and it will kick off on March 28th, 2018, with the stylish and tragic “The Last Verse.” The films features Taiwanese actor Fu Meng-po as a star-crossed character nicknamed Poet, and is directed by Tseng Ying-ting. For more details about the screening, click here. “The Last Verse” is part of Season Six of Chicago’s Asian Pop-Up Cinema, which features a diverse line-up of films, with Japan, South Korea, Taiwan, China, India and Hong Kong all represented, and all with English subtitles. Screenings occur at the AMC River East 21 in downtown Chicago, with other various locations for special events and a number of free screenings. APUC is curated by founder and film programming veteran Sophia Wong Boccio. Taiwan Cinema Days continue with “A Fish Out of Water” on April 4th (click here) and “The Great Buddha” on April 5th (Click here). 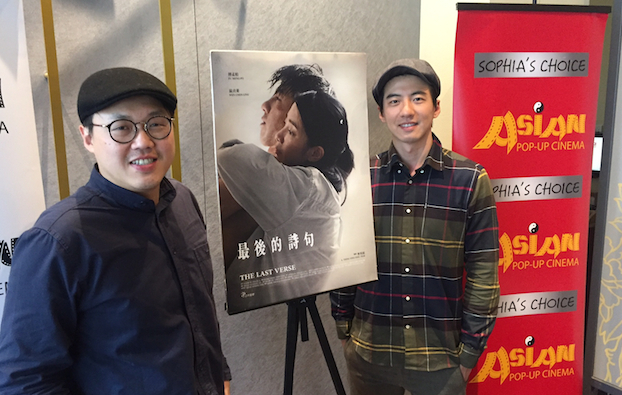 “The Last Verse” tells of two lovers (Fu Meng-po and Wen Chen-Ling as Xiao-ping), followed from age 18 to their middle 30s, and the difficulties they have in their relationship due to both the economic woes of Taiwan and a debt that has to be paid. HollywoodChicago.com spoke to Fu Meng-po and director Tseng Ying-ting through an interpreter, in anticipation of their appearance at the APUC screening. HollywoodChicago.com: Tseng, which of your friends or what element of your life inspired this story? Tseng Ying-ting: The film was commissioned by Taiwan public television, who gave me a topic to base the film upon. My topic was poverty in the youth generation, due to economic factors. I based the film on my experiences, and my friend’s experiences, and applied it to the final script. HollywoodChicago.com: Fu, two times in the film you had to show extreme emotion, which was akin to a nervous breakdown. How did you understand what you wanted to do when the scenes were filmed? Fu Meng-po: In the script, the description was ‘slap yourself until you collapse.’ I decided to interpret it in the moment, when the scenes actually occurred. The emotions felt like a piece of fruit when it is crushed, it just flowed out and burst. HollywoodChicago.com: Tseng, the mystery of the poem that the Poet wrote in the beginning of the film, pays off when it is finally revealed. Who wrote that poem, and what does it mean in the context of where you placed it in the film? Ying-ting: The poem was written by Shih Hong-Ru, my co-screenwriter, and she’d written poetry since high school. I asked her to write the poem to describe the emotional state of the Poet’s character as he first met his lover Xiao-ping, and it fit perfectly once it was revealed in the film. HollywoodChicago.com: Fu, the character of the Poet has ‘sins of the father’ to deal with throughout the film. How did that define the character, and how did you approach the interpretation? Meng-po: It is based in the Asian culture, where the ‘son repays the debt of the father.’ This kind of relationship and payback is embedded within the culture. In my interpretation, it was a double edged sword. My character had experienced his father’s failure in the family, which including driving his mother away. And I always reminded myself that the character never wanted to act like his father, which helped me to find direction. That also affected the relationship with Xiao-ping in the film, because he was always questioning his ability to have a normal relationship. HollywoodChicago.com: Tseng, you use the immigration of the Poet to China as a plot point in ‘The Last Verse,’ and your first film ‘Ye-Zai’ dealt with immigrants into Taiwan. What fascinates you about this issue? Ying-ting: It happened both ways… the Chinese came to Taiwan in the early 1980s and the Taiwanese went to China between 2010 and 2012. As always, it’s mostly an economic issue regarding jobs. In both films, it gives a shorthand version of the relationship between the two places, and that’s what I wanted to communicate. HollywoodChicago.com: Fu, you recently won Best Actor for ‘The Last Verse’ at the Golden Bell Awards in Taipei. What is exciting for you about being an actor in Taiwan right now? What kind of stories and filmmakers get you excited? Meng-po: I will work with anybody that produces a story that moves me, and has a character that I can perform with confidence, to bring that story to the audience. If I can make it believable, and know that I can get the audience to feel the story as I felt it, then that is a role I want to take on. HollywoodChicago.com: Finally, for both of you, given that this story was very emotional, and you both had different roles in telling the story, how did it change your life after it was done? Ying-ting: It wasn’t my original idea to make the film, since it was commissioned by Taiwan public television, but what changed afterward is that I’ve been given many more opportunities to direct film and television, with room to expand. The film must have struck a chord, because in these new projects they want both high emotions and political commentary. Meng-po: As I approached the material, inside me it felt like I had a silent friend who I wanted to perform this story for, and we took the journey together. This gave me the freedom and self reflection to do the role. I knew it was a unique acting opportunity, because the character portrays so many feelings. For a performer, it was almost a perfect job. In the end, it made me a better actor. Season Six of the Asian Pop-Up Cinema series continues with the Midwest premiere of “The Last Verse” on Wednesday, March 28th, 2018 (7pm), at the AMC River East 21, 322 East Illinois, Chicago. For an overview and schedule of the Asian Pop-Up Cinema series for Season Six, click here.